Real wages have fallen, but that's not the same as saying that everyone is earning £1,600 less than they were in 2010. The median employee in 2014 (the middle earning person) earned less than the median employee in 2010. How much less depends on how you account for inflation and how you measure earnings, as we cover here. In this case, the median doesn't tell us very much about 'people' generally; the other employees, let alone people who are self-employed. The median employee turns out not to be typical. It also doesn't tell us about how much money people take home as it doesn't take any account of how taxes and benefits affect people's incomes. Even if all of these problems didn't exist, we'd still be talking about numbers that are almost a year old, when we know that real wages began to rise late last year. There is a serious point contained within this figure. Growth in prices has outstripped growth in wages for the majority of this parliament, and people are substantially worse off than they might have been. But the use of a single figure to represent all people's experiences will inevitably conceal at least some valuable detail. As the chair of the UK Statistics Authority has pointed out, the change in the median wage "does not typically represent the pay rise that most people in employment would actually experience during that period". When median wages are falling, large numbers of people can still experience pay rises. Even when the majority were experiencing real terms falls in wages, about a third of full-time employees who stayed in work got a pay rise. Last year, it was about half. For people in the same full-time job, median pay has risen faster than inflation in almost every year since 2010. But this doesn't mean that everyone enjoyed pay rises. Counter-intuitively, unemployed people moving into work, which is a good thing, can lower growth in the median wage, which seems like a bad thing. This happens if they take lower paid jobs, even though they increase their own earnings by doing so. Over the last year, young and unskilled workers moving into work has slowed wage growth, whereas earlier when fewer were getting jobs, they had less effect on wages. Even when everyone still in employment earns more than they used to, the median wage can fall. Imagine an economy with 3 people in it. In 2010, the first person is an apprentice and earns £2. The second person is a supervisor, and earns £4. The third person is a director, and earns £6. By the time the clock ticks around to 2014, the director has retired and a new apprentice has entered the workforce. The person who was an apprentice in 2010 is now a supervisor, and the former supervisor is now a director. Because the economy is underperforming, the jobs don't pay as well as they used to. The apprentice earns £1, the supervisor earns £3 and the director earns £5. 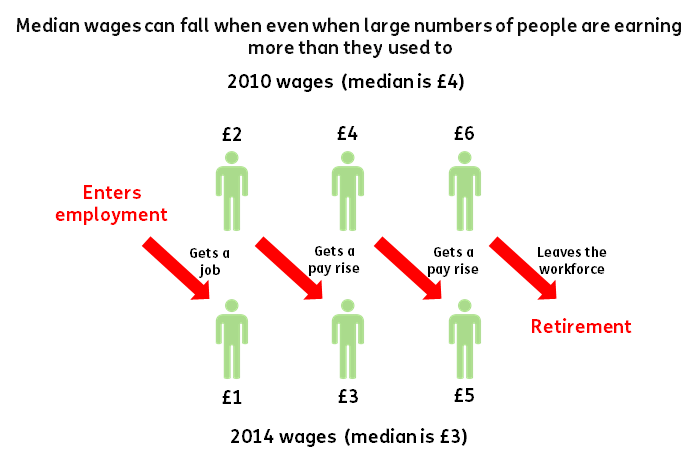 The median wage has fallen to £3, but every worker still in employment has had a pay rise since 2010. The median is quite a good measure of the change in wages because it tells us what's happening to the person 'in the middle'. However, it doesn't tell us whether the poorest workers are experiencing larger or smaller changes in their wages. Again, the UK Statistics Authority have drawn attention to this, saying that "the median measures presented in ASHE relate only to the earnings at the centre of the distribution, regardless of any changes in other parts of the distribution". It's debatable how helpful attempting to boil the cost of living down to changes in average wages really is. A £1 pay cut hurts a low earner more than it does a high earner. Inflation also affects different people differently, as they spend their money on different things. The £1,600 figure has been calculated using data that's almost a year old. Labour have used data from the Annual Survey of Hours and Earnings (ASHE), which is conducted in April each year. Things have changed since April 2014, and more recent data for a different measure of wages shows that wage rises have outstripped inflation since August-October 2014. This means that the £1,600 figure might overstate the fall in living standards, particularly given the low inflation over the last few months. Finally, ASHE measures pay before taxes, and ignores changes in benefits. As the Institute for Fiscal Studies have said, if a taxpayer's income falls £1,600 then the most that their net pay can fall is £1,100. Excluding the effects of cuts to benefits and benefits in kind (like healthcare) obscures the pressure these put on living standards. And cuts to public services often hit the poorest members of society the hardest. We updated the section 'Many people are better off' to clarify that median wages rose and that not everyone enjoyed a pay rise.